Campbell Scientific Ltd. and pupils from Redmoor Academy in Hinckley were recently featured on the BBC’s Stargazing Live "Eclipse Special" taking part in a National Eclipse Weather Experiment (NEWEx) organized by Reading University. Campbell Scientific had originally invited a small group of Redmoor students to their Shepshed offices to take part in the experiment during the solar eclipse. 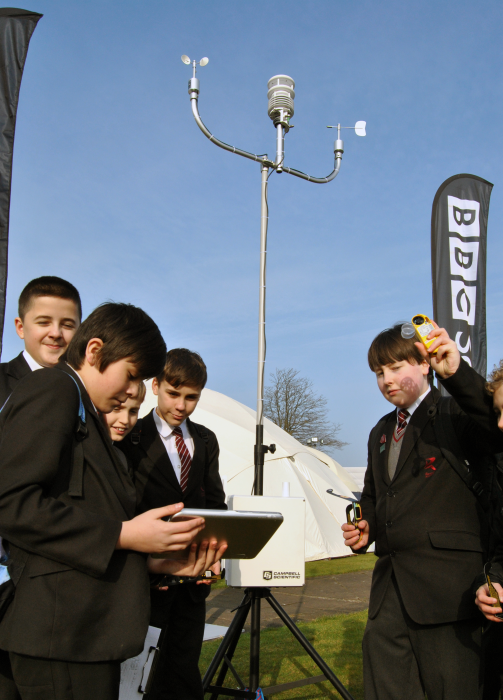 However, following an approach from the BBC, the company was invited to instead take a weather station and a bigger group of children to the Stargazing Live event organized by the BBC at Leicester Racecourse, where they would be filmed participating in the experiment live on TV. The event, attended by several hundred Leicester school children, offered a perfect viewpoint for the eclipse, plus there were a variety of space-themed scientific activities scheduled throughout the day. Campbell Scientific’s STEM Ambassador, Iain Thornton, installed an automatic weather station at the site and, as the eclipse began, around 40 Redmoor pupils gathered around it to record measurements using the station and some handheld sensors. BBC Newsround presenter Leah Boleto, TV weatherman Peter Gibbs, and Stargazing Live presenter Dr. Lucy Green spent about an hour with Iain and the children and filmed three live segments with them during the eclipse. The weather station was configured around a CR6 datalogger. This datalogger was chosen because of its web-hosting capabilities. Measurements of wind speed, wind direction, solar radiation, air temperature, and barometric pressure were taken using a Lufft WMS520 "all-in-one" sensor (kindly lent by Lufft). For visual effect a wind vane and anemometer were added to the station, although these were not connected. A custom display was created in RTMC Pro, and this was hosted on the datalogger, which acted as a web server. The datalogger features an integrated Ethernet port and was connected to a Wi-Fi router so that the display could be accessed remotely on laptops and tablets nearby. Some of the children used handheld Weatherhawk WindMate sensors to measure the wind and the temperature. Weatherhawk, a subsidiary of Campbell Scientific, donated these devices for this event and for future use at other educational activities. Weather readings were taken before, during, and for a short while after the eclipse. Data clearly showed a temperature dip and, of course, a reduction in the level of solar radiation; unfortunately, winds were too light to show if there was any change in speed or direction. Readings were uploaded to the NEWEx web page to be included in the national analysis. Campbell Scientific has a long-standing relationship with Redmoor Academy and has supported them with both equipment and by releasing staff to act as STEM Ambassadors to work with pupils in lessons and at after-school STEM clubs. Following the eclipse the children visited the various exhibitions and activities around the site. These included a live comedy show about the space race, trying on a real spacesuit, controlling mini Martian Rover vehicles, hearing about meteorites, and a coding activity involving Daleks.